If the courts are about making money out of us - then what would they be interested in Justice! The evidence and cases experienced by those by IDP founders is that the courts are only interested In-Just-US Corps. Back in 1990, Federal judges and clerks down in South Texas got to thinking "Damn, with all the fees lying around, shouldn't we invest it and make some money off it?" Pretty soon, they cooked up the Court Registry Investment System (CRIS), on the recommendation of financial analyst (now Clerk) Mike Milby, and with permission of the U.S. Treasury and Federal Reserve Board of Governors. The pooled funds never actually leave the US Treasury account in the Texas Commerce Bank of Houston because the Bank invests them in US Treasury Bills through CRIS investment managers at JP Morgan. Thus all 25 member US Court Districts always have funds available to disburse for their various purposes. Not only does the court have several billion dollars in the pool and over a billion dollars invested at any one time, but also it earns upwards of a million dollars a month in interest alone. And it charges a registry fee of upwards of 10% for managing the investment (rather than taking the fees out of earnings). Member District Courts share proportionately in CRIS earnings. See the US COURTS press release on CRIS here; see Google links here. I have attached a RAR archive containing documents. If you cannot open it, get and use WinRAR or Jzip or 7zip. consistent with objectives 1 and 2.
have an average maturity and an average yield approximately equal to one year U. DONE at Houston, Texas, on this the day of December, 1990.
in, the Final Judgment of permanent injunction and other relief as to Michael R.
DONE at Houston, Texas, on this the 29th day of December, 1990. Vol. 55, No. 206, at Page 42887.
annual basis for funds deposited prior to December 1, 1990. ADOPTED by the Full Court this day of 1990. The above-linked document shows how federal courts earn interest on the money they receive in fees, fines, etc. Basically they invest the money, presumably on petition from the payor, through the South Texas USDC CRIS. Procedures begin on page 36. Pages 44 through 59 provide flow charts showing how CRIS administers the money through JP Morgan (which gets a nice fee for the service). Do you suppose the investment managers securitized the investment fund? Shouldn't the investment fund reduce the amount of fees the people must pay for court services, transcripts, PACER, and so on? When you pay fines or fees, should you designate them to go into CRIS investment? If you do designate them for CRIS, will YOU receive the earnings? Should you write to your legislators about this? No one should ever go into court – with or without a lawyer – before they read this and understand what is really going on in our courts! In matters of pure common sense, it would be a very bad idea to appoint a fox to guard your henhouse. For this reason, it has been a maxim of law for hundreds of years that one cannot settle a matter as an impartial 3rd party when one has any special financial interest in the outcome (other than for due wage compensation). To handle a matter with no special financial interest in the matter means that one has “clean hands”. Of course, as demonstrated here, the United States Supreme Court is actually a “business”… And we know that the same goes for almost every other court in the world. Therefore, what we are dealing with is a false judicial system. And this brings us to the “CRIS” accounts. The CRIS (Court Registry Investment System) account is what connects the false judicial system to the bank; it is the mechanism through which they access funds that were created in your name without your knowledge. IN THE USA THE LEGAL SYSTEM IS NOT WHAT LAWYERS – AND THE MEDIA – TELL US IT IS! CRIS (Court Registry Investment System) ... the court system. 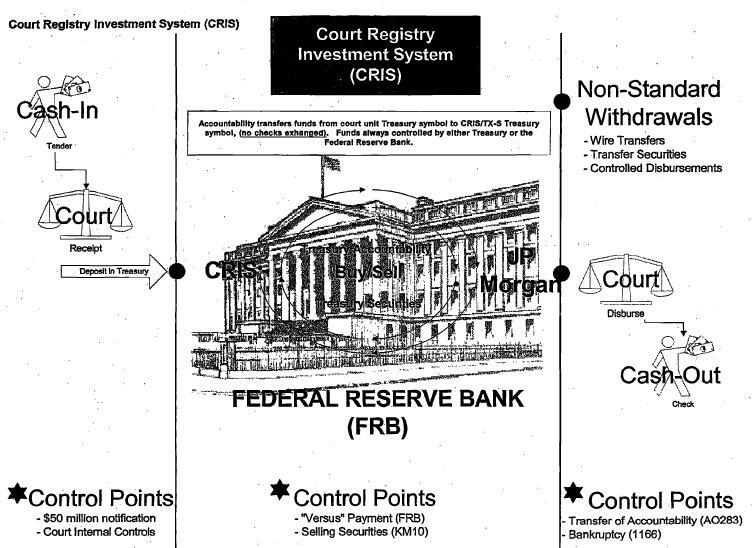 What few people realize is the courts are a money ... com/Court_Registry_Investment_System.pdf. US District Court Local Rules Jury Service ... instrument must be submitted prior to the tender of such funds to the court. 1. Court Registry Investment System. The principal sum deposited in the registry of the court plainly was private property, and was not the property of Seminole County. This is the rule in Florida, Phipps v. Watson, 108 Fla. 547, 551, 147 So. 234, 235 (1933), as well as 161*161 elsewhere. See Coudert v. United States, 175 U. S. 178 (1899); Branch v. United States,100 U. S. 673 (1880); Sellers v. Harris County, 483 S. W. 2d, at 243. We do not understand that the appellees contend otherwise so far as the fund's principal is concerned. purchase for $1,812,145.77 substantially all the assets of Webb's Fabulous Pharmacies, Inc.